As of Friday, July 15, 2016, Portland State University Library has cataloged more than 10,000 titles from Dark Horse Comics. As the official archive of Dark Horse publications, Portland State University Library began cataloging Dark Horse books, comics, graphic novels, and more in 2007, and the work continues to this day. Dark Horse gives copies of all materials produced by Dark Horse to PSU Library, resulting in a complete and preserved collection of the Dark Horse corpus. It is a unique browsing and research collection of comic books, graphic novels, collected editions, related books, statues, figures, and other materials. 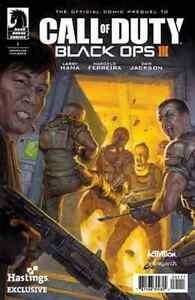 Cataloging Technician Teresa Stapelberg cataloged the 10,000th item, one of the variant covers for Call of Duty: Black Ops III, #1. The browsing collection is available on the third, fourth, and fifth floors of the Library, along the curved windows. There is one copy of every Dark Horse comic book, graphic novel, collected edition, and book. The collection is available for reading in the Library or for checkout. The research collection contains one copy of every Dark Horse comic book, graphic novel, collected edition, book, print, poster, statue, figure, and all other products. The research collection is available by appointment in Special Collections on the Library’s first floor. The Dark Horse Comic Collection at Portland State University Library provides a unique legacy for Oregon’s premier comics company. Learn more about the Dark Horse Comic Collection at Portland State University Library.